Pawn Your Gift Cards for Cash – You Don’t Have to Sell Them! Do you have gift cards laying on your dresser, or tucked away in a box somewhere given to you last Christmas? Or maybe even two or three holidays ago, or from a birthday? Friends and relatives who give you give gift cards as presents have the best intentions, hoping to provide you with the most flexible possible gift that you can spend any way you see fit, but sometimes those gift cards are redeemable at retailers, restaurants, and other places that you don’t ever visit. In any case, if you’ve come into possession of gift cards that you don’t intend to use personally, why not pawn your gift cards in Mesa, Arizona, to convert them into cash which you can use on something you do want to buy? Your gift cards won’t have the same cash value if you were to pawn them, as they would have at the intended retail outlet, but whatever you get for them is much better than just letting them go to waste. That being the case, do yourself a favor and bring all your unused gift cards to our pawn shop store in Mesa, Arizona and get some cold, hard cash for the plastic that you don’t intend to use. We Welcome Various Gift Cards! On the other hand, it could be that you’ve received gift cards where you typically would shop at or dine at, but you merely prefer to have the cash so that you can use it toward other necessities. Alma School Pawn will accept your gift cards here at our pawn shop store; giving you the highest payout possible for each one. We might be able to provide you with an idea of the cash value of a particular gift card in store; so it’s always best to bring your items of value into our store so that we can make an on the spot appraisal and provide you with the cash you need as quickly as possible. We accept most gift cards from retailers all over the state of Arizona, especially in the nearby communities of Chandler, Gilbert, Tempe, Scottsdale, Apache Junction, and Phoenix, so by all means, bring your cards into us at your earliest convenience. Okay, so Our Gift Cards Are NOT those. How much are you willing to give? Ah, the Million Dollar Question. 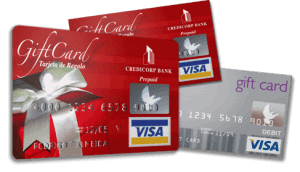 The answer is this: We usually offer up to 50% of the value of the card itself in most cases. In regards to anything higher than this, it is a case-by-case basis at the discretion of the store manager. While we wish we could empty the entire amount, we honestly can’t. Even WE have limitations, per law. As long as you’re bringing in those gift cards in for redemption, why not look around your household to see if you have any other items of value which you can either redeem for cash value in our store or which is collateral in a 90-day agreement with us. During that 90-day agreement, you’ll have the option of paying on just the interest part of the loan to maintain your account in good standing with us, although paying some amount of the principle as well will help you to pay the loan off in a timely fashion, and steadily reduce your outstanding balance. Once you have paid off your pawn loan agreement with us, you would again take ownership of any valuables pawned, and you would be free to set up another pawn loan agreement with us, whenever you care to bring in something else of value.